Online chat software includes any program which transmits short text messages between the sender and receiver. 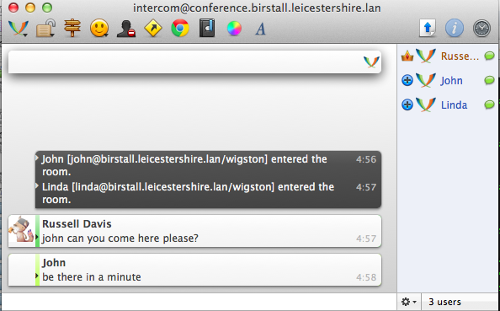 These realtime keyboard-to-keyboard messages create an environment similar to a spoken conversation. A chat session may involve one-to-one communication or group meetings. These programs are valuable for quick question/answer interactions where immediate replies are important. Timestamped conversation history is typically saved for future reference. Chat programs are one of the least network-intensive types of communication programs, so they are a good candidate as low impact services on a mesh network. Many chat programs also offer file sharing, which allows you to get two functions within a single program. The following list is not comprehensive or complete but represents a sample of the types of chat programs that might be available for you to use as services on your mesh network. Only programs with open source licenses were included in this list, although commercial chat software can also be used. MeshChat has become the primary chat service for AREDN® networks because it was written specifically for mesh communication. 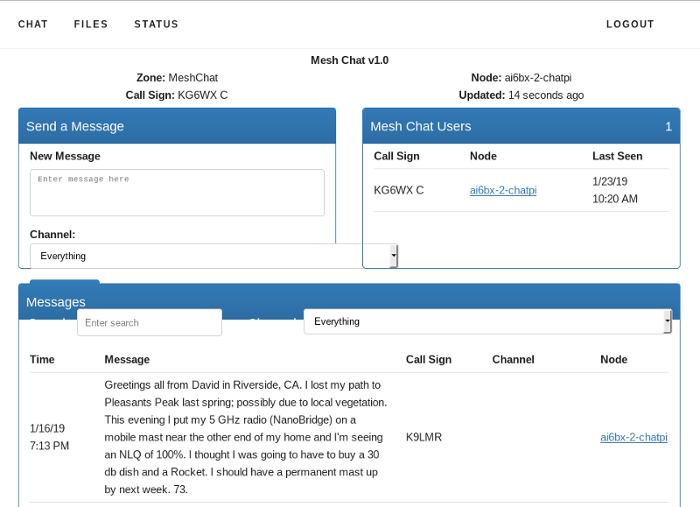 Users access MeshChat via web browser, and the service runs on the mesh node itself or on a LAN-connected Raspberry Pi computer. 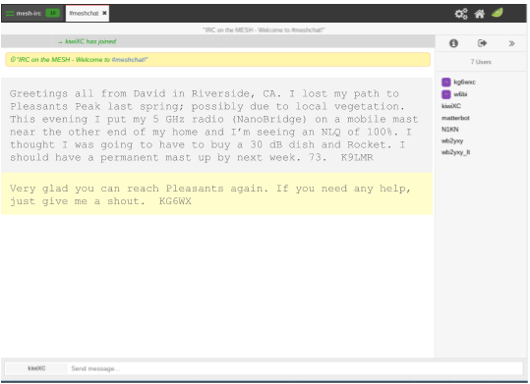 After logging in by entering a call sign, send a message by typing into a text box and clicking the Submit button. The list of active users is displayed, and every message is visible to all participants on the chat service. Multiple Zones and Channels are supported for categorizing and separating message traffic. The message database is stored on every device where MeshChat is running. Nodes may have intermittent network connectivity, but as long as at least one node is available the MeshChat database remains intact. Once nodes come online they immediately catch up by retrieving a full copy of the message database. If any new messages are found, they are appended to the local message database. In addition to the keyboard-to-keyboard chat feature, MeshChat also allows files to be shared between nodes. Files may be uploaded from or downloaded to the user’s computer at any time. If MeshChat is running on a radio node then the file storage is limited to 500 kb, but if running on an external computer the file storage is limited only by the size of the disk that is allocated for MeshChat files. 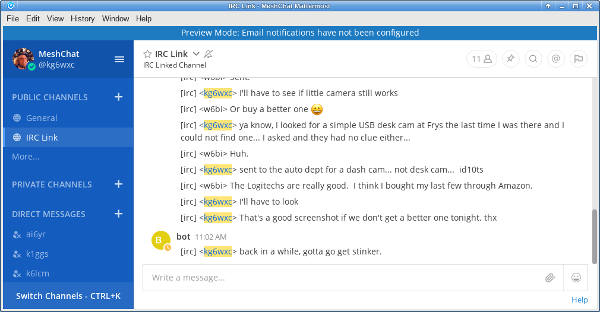 Several implementations of Internet Relay Chat are available, either as open source software or in proprietary versions. The Internet Relay Chat Daemon (IRCd) is a server program that listens for connections from IRC client programs and brokers the communication between the connected clients. With this client-server architecture, the IRC server must be available on a network link with sufficient bandwidth in order for the clients to function. Originally known as Jabber, XMPP servers have been around for a long time but are fully compliant with modern messaging standards thanks to a large community of developers worldwide. These servers provide one-to-one messaging as well as group chat sessions. User lists have activity and presence indicators, and chat history can be archived for later use. There are dozens of feature modules available for XMPP servers which can extend the functionality as needed. 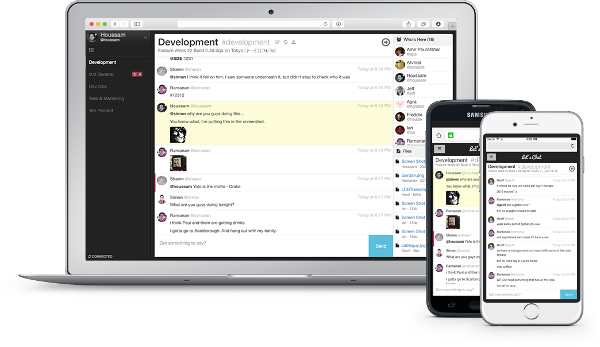 The Mattermost Team Edition is an open source platform that supports mobile and desktop messaging apps. It provides one-to-one and group messaging, file sharing, and message history with search capabilities. It is often described as an open source alternative to the commercial Slack communication tool. 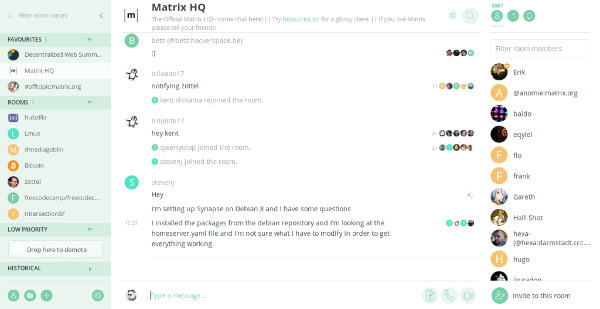 Synapse is the “homeserver” implementation of the Matrix communication platform. As with a traditional client-server architecture, every user runs a Matrix client that connects to a Synapse server which stores the personal chat history and user account information. However, these servers communicate with each other on the network, which creates a distributed content architecture that minimizes single points of failure. © Copyright 2019, AREDN Revision 929dff90.